Have you heard the news? Sears Canada is hosting the 12 Days of Giving and it’s happening RIGHT NOW! The focus is on giving and granting wishes; it is the holiday season, after all. They have planned 12 consecutive days of giving to people, organizations and communities across the country. Sears Canada is no stranger to supporting local communities. In fact, they’ve been doing it for over 60 years supporting causes and charities that help Canadian families. You may have heard of their “Tree of Wishes” already. It was launched in 1998 and provides 15,000 toys to children each year. Then there is “Operation Wish” which is celebrating its 10 year anniversary. The 12 Days of Giving is their biggest campaign yet. I think it’s fabulous the way they give back. It captures the true spirit of the season. Through the 12 Days of Giving, Sears Canada is supporting charitable programs like Boys & Girls Clubs of Canada, Beauty Gives Back’s Look Good Feel Better charity for women living with cancer, hospitals and more. Today, I want to tell you more about day 6 of the 12 Days of Giving as it supports organizations that have a special meaning to me, Military Family Resource Centres. Day 6 is on Sunday, December 6th and is aptly titled, Operation Wish. Sears Canada is showing support for military families across Canada by offering a 15% discount on any purchase in-store, online or through the current catalogue. This includes active and retired military members, reservists and family members. They are also donating $10,000 to help support local Military Family Resource Centres (MFRC’s) youth oriented programs. Sears Operation Wish has donated over $170,000 to support national and local military family support programs since it began in 2006. Have you met Darcy? He (or she) is a limited edition plush bear with a festive green sweater with a reindeer on it. 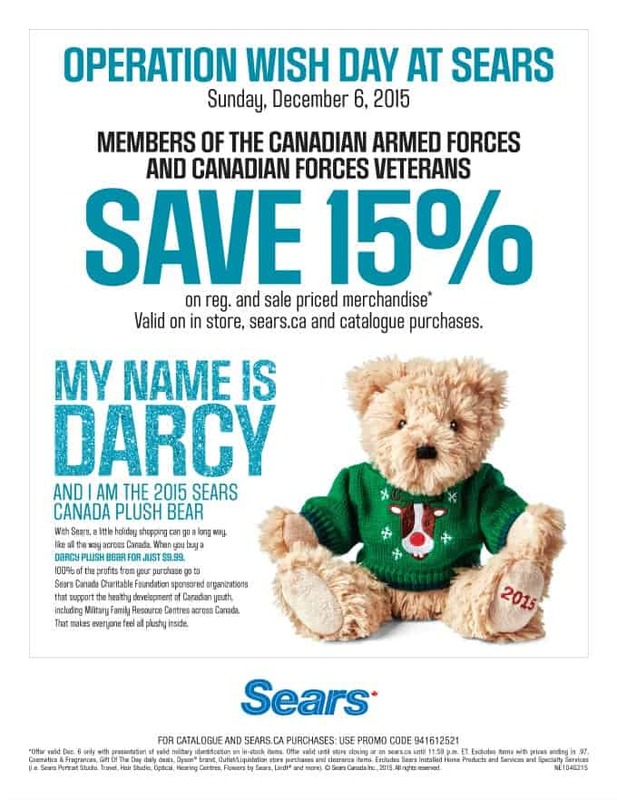 100% of the proceeds of the sale of Darcy are donated to the Sears Canada Charitable Foundation. Out of these funds a percentage of the proceeds is donated to local MFRC’s on an equal basis. You’ll also be able to buy matching sweaters for the family, similar to Darcy’s, as part of this initiative. They are available in three colours and three different motifs. A special surprise is planned for later that night! Can’t wait to see what it is. I’ve been part of the military community since 1998. My first husband, the father of my two daughters, was and still is actively serving. John, my fiancé, is a veteran, retiring at the end of 2013. I was no stranger to the MFRC when we were posted in Edmonton. I had no family in Alberta and relied on many of their services to help me through deployments and childcare dilemmas. They had a drop-off program about once a month where parents of deployed members could take their kids for a couple hours so they could have a break. I used that service a few times because I had no help from family. I felt peace of mind knowing the support was there if I needed it. They offer many, many other services and are an integral part of the military community. Day 6 will only last for 24 hours from midnight to midnight EST on December 6th. You’ll be able to access the deals through Sears Department stores, Sears Home stores, Sears Outlets stores, Sears Hometown store, all current Sears catalogues and online at www.sears.ca. This event is the perfect opportunity for you to support causes near to your heart and get some holiday shopping done. Sears Canada has loads of items to choose from including parkas, appliances, home decor and toys. Make sure to check out the Sears Wish Book to see what’s hot this season. I also encourage you to check out the 12 Days of Giving site and see what is coming up during this special event. Join the conversation online with the #12DaysofGiving hashtag on Instagram and Twitter. You’ll be able to see pictures, videos and more from each event. Which day during the 12 Days of Giving is closest to your heart? Disclosure: I received a gift card as compensation. All opinions expressed are my own. Day 2 – In Store Surprise and Delight is closest to my heart! The JANEWAY HOSPITAL TOY SHOP, really strikes my heart. I am so lucky to have a healthy family that I love helping and donating to families who aren’t so lucky. Day 7, Tree of Wishes, is closest to my heart. The tree of wishes is closest to my heart. Day 1 – National Volunteer Day is close to my heart because I have been volunteering in my community for over 30 years. Home for the holidays sounds wonderful. Day 1 means a lot to me. I love to give in this way, too. The Tree of Wishes is closest to my heart. my husband and I buy presents for several kids as part of our local angel tree program. Day 6. Thanks for being so amazing and having such a awesome blog! Day 10 is the closest to my heart! Day 7, Tree of Wishes is closest to my heart. No child should go without presents for Christmas. Day 1 is most dear to my heart since it is something I try to do as often as I can especially for the holidays! Tree of wishes, Day 7. Really generous day. Day 7 – The Tree of Wishes is my fav, it’s such a great idea!